Darkglass has another winner on its hands here; a great alternative to the Microtubes 900. Same stunning design and solid sound as the Microtubes 900 but more affordable. The front panel looks a little crowded. Graphics are hard to read on a dark stage. It’s only eight years since Doug Castro and his small team at Darkglass Electronics released the first Microtubes stompboxes, but in that short time the Chilean/Finnish company has made a major impact on the bass world. Its clean, industrial design and outstanding sound quality has seen the company rise rapidly to an elevated position in the crowded and competitive world of bass effects. Does that qualify it to build bass amps? It would seem so. In 2016 Darkglass released its first bass amp, the Microtubes 900, and it was an immediate success. The new Microtubes 500 is a simplified version of that original amp in a more compact package. Like its big brother it’s a striking piece of design; even the packaging has a kind of tactile gorgeousness, before we even open the box. Once unpacked, the quality of materials and design are immediately apparent, but due to its small size, the front panel does look a bit crowded. The small, dark grey graphics are quite hard to read against the brushed aluminium front, so on a dark stage you’ll need good eyesight until you work out where the relevant controls are. The top row of controls represents the clean channel, and consists of a four-band EQ – Bass, Lo Mid, Hi Mid and Treble – plus an input gain and on the far right, a master volume. The Hi and Lo Mid controls also have switches allowing you to choose alternative frequency ‘centres’, giving you a much wider range of adjustment for those all-important mid-frequencies. The bottom row of controls looks after the ‘Microtubes Engine’. This can be selected via a small button on the front panel or, more practically, via the ‘intelligent’ footswitch – unfortunately, sold separately. This section operates before the clean circuit, so you can still use the EQ. A separate front panel switch allows you to choose between two distinct characters of overdrive tone - a warm, classic VMT for Vintage Microtubes, or the crisp, tight and contemporary-sounding B3K. Once chosen, you can adjust your overdrive with the Drive, Tone and Level controls, then use the Blend control to add as much or as little of this to your clean sound as you wish - easy. Around the back there’s a single speaker output, an XLR DI with pre/post and ground lift switches, effects loop, and 1/4” jack headphone socket. Darkglass made its name with overdriven and distorted bass circuit designs, so you’d expect the drive engine of the Microtubes 500 to be good. It is, and what’s equally impressive is the open, detailed quality of the clean sound. The beauty of the 500W ICEpower power-amp module is that it’s completely transparent, which means that the only thing between you and your bass before the speakers is the preamp and EQ. That’s good because as we know from their pedals, if there’s one thing Darkglass excels at, it’s bass tone. The drive controls (Drive, Tone and Level) all work exactly as you’d expect, with a smooth and even response. The difference between the B3K and the VMT circuit is striking. We loved the Darkglass Vintage Ultra pedal when I tried it, and with VMT selected on the Microtubes 500 you get exactly the same creamy, natural distortion. It’s one of the best overdrives you’ll hear, and the response and subtle tube-like compression remind me of a vintage Orange or Hiwatt valve head with the taps wide open. By contrast, the B3K circuit is more like a distortion effect. The percussive saturation has a solidity to the low end that makes it perfect for really digging in and rocking out. 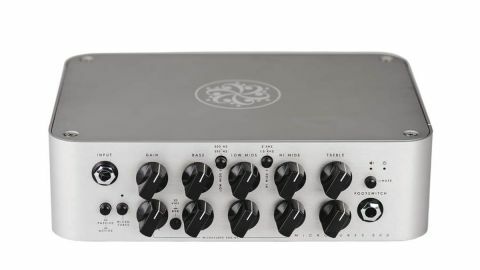 There are aspects of this amp that remind me of the EBS Fafner ll head we reviewed a while back, and it’s interesting that both amps come from Scandinavian companies. Both have an emphasis on the overdrive and distortion aspects of their sound, making them perfect for rock and metal players of any subgenre. Where the Darkglass scores over the EBS in my opinion is in the design, size, weight and the glassy transparency of the ICEpower digital amp. This makes it a great choice for bass players whose style and preferences mean that the overdrive aspects may only be of secondary importance. Those who just want plenty of power and a clean, neutral sound will also find that the Microtubes 500 perfectly meets their needs.